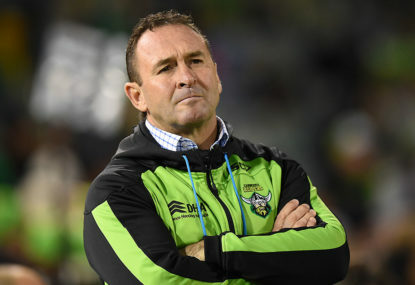 Canberra captain Jarrod Croker says his side has no choice but to respond after coach Ricky Stuart labelled them “soft” after their 32-16 loss to Manly. An irate Stuart watched the Raiders slump to their worst start to a season in 21 years on Saturday night, after Manly blew them out of the water in a dominant first half. But with a short turnaround into Thursday’s cash with Canterbury, Croker said his team had no time to feel sorry for themselves. “We don’t have a choice … If we played tomorrow we would have to play better than that. Stuart, a Canberra legend who played 203 games for the club, let loose at his players following the 16-point loss. Four of the Raiders’ starting forwards failed to reach 60 running metres, while Manly’s two starting props Addin Fonua-Blake and Martin Taupau made 330m between them. “Soft. Soft football, soft pieces of play, soft choices and I’ve probably protected them for too long,” Stuart said. “Over the past three weeks I’ve thought their effort was there. There was no effort in that first half, that wasn’t us and it was soft. Stuart uttered the worst “soft” ten times in his four-and-a-half minute press conference, as he berated the team he took to the third week of the finals in 2016. Meanwhile, rival lock Jake Trbojevic expected Stuart’s spray to galvanise the squad even though he didn’t have any such objections to Canberra’s output. “I’m not going to say they’re soft, but if the coach says you are it will sting you,” the Manly star said.